Do you find your conservatory is too hot in the summer?. Are you blinded by the suns unbearable glare?. Having window film installed on your conservatory will make it a usable room year round..
Conservatories are a great addition to any home, for the reason that they can transform any living space, hence, we often find most are used as second living rooms. They can make you feel at one with the great outdoors (your garden) and are yet, still a permanent weather proof room to to be used year round. Or are they? Maybe you have just spent thousands of pounds on a lovely new conservatory or maybe you have had the same one up for years. However, do you find it seems like its not the year round room you were hoping for? How would you answer? Do you find yours cold in the winter and boiling hot in the summer? Does the suns glare blind you, or reflect off the television screen? No doubt it seems you are here, reading this because you can answer YES to those questions and want to find a cost effective solution. 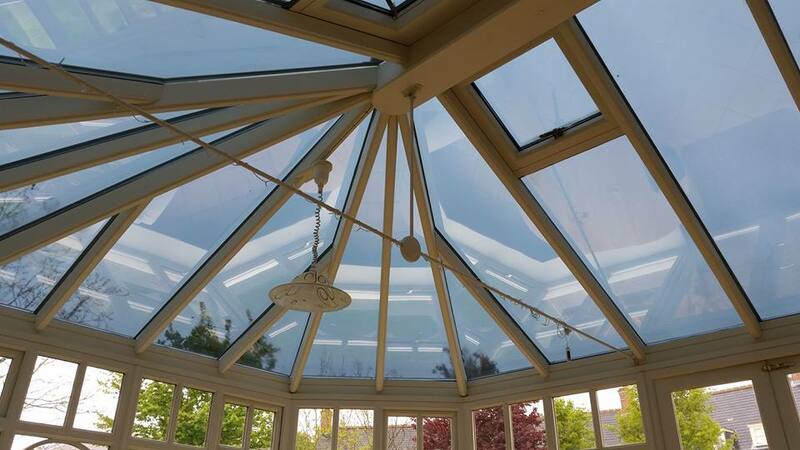 So, before you admit defeat and only use your conservatory in the spring and autumn, or use throws and blankets to protect your furniture, we can help you use it year round, without removing the beauty of the glass roof. Glass Enhance have been installing conservatory window film for over 12 years. As a result, those years of experience can give you confidence that we know what YOUR needs are, and that WE have the best products coupled with our meticulous installation techniques needed to provide a high quality finished product. As a result we are sure that it will consequently transform your, “few times a year conservatory” to an everyday room. 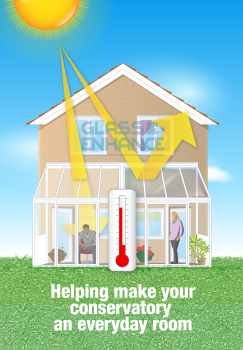 The Problem – Is your conservatory too hot? Glass conservatory roofs are becoming a more popular choice for home-owners. However, the down side is they trap a lot of heat in them which can be so over whelming that sitting in your conservatory feels more like sitting in a greenhouse. As a result, you must have found that when you open the doors into your conservatory in the warmer months of the year, the extreme heat makes your conservatory near enough unusable. Our premium conservatory window films can block the suns total solar energy by as much as 79%. The result is a much more comfortable conservatory. The Problem – Blinded by the Suns Glare? No doubt you find yourself blinded due to the suns glare when trying to relax in your conservatory. Or do you find trying to sit and watch television or look at computer screens nearly impossible due to the amount of glare. As a result, your conservatory becomes un-usable. After you spent a lot of money on your conservatory, you want nice furnishings to go in there, because it is a place to relax. Unfortunately, that brand new sofa, or expensive wood flooring takes a hammering, not from you, but from the sun and its damaging UV rays. The last thing you want is to see them ruined within months by excessive fading. However, that is the unfortunate reality for many people. As a result, you can have full peace of mind that with our conservatory window film, you, your family and your furnishings will be protected from damaging UV rays 24/7 for more then 10 years. Can you see through conservatory window film? First of all, like mentioned above these films are designed to reduce the glare, heat and UV. Hence, as a result, the films will have a tint or color to them, but they’re beauty is that they still maintain perfect optical clarity, so you can still see the stars at night when looking up through your glass roof, or enjoy the view you previously blocked with blinds. First of all, we need to look at heat transfer through a window. Solar Heat is transferred or transmitted by UV, Visible Light and Infrared Waves. Radiant energy is converted to heat when it strikes people or objects. Therefore if you block or interrupt the transfer of this energy you keep it from turning into heat because it never strikes an object. Conservatory window film interrupts the transfer of this energy by reflecting solar energy away. Transmission or transmittance is the percentage of solar energy which we know as a combination of UV, Visible Light, and Infrared that passes through a window. Reflection is the ratio or percentage of solar energy reflected back to the source. Absorption is the percentage of solar energy absorbed to that of the total solar energy. Hence, this heat reflection and absorption transfer differs on each individual films specification. 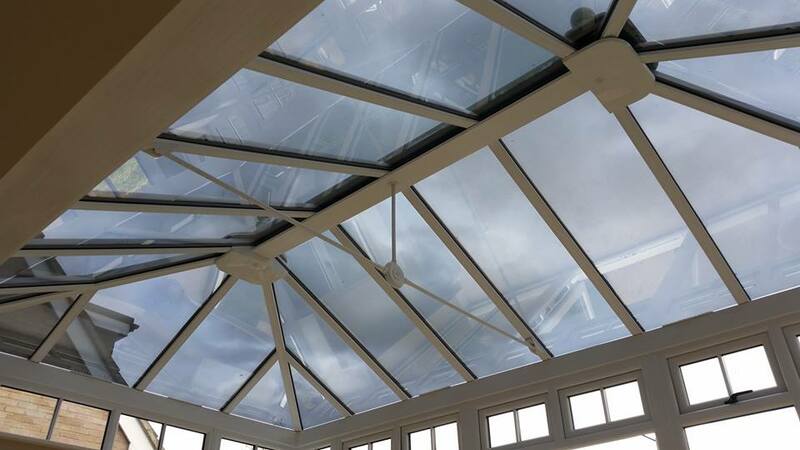 We know exactly what solar films would best suit your needs to reduce the solar heat, glare and UV rays from entering into your conservatory. What is Conservatory Window Film? Conservatory Window Film is a Solar Control product made up of micro layers of polyester known as laminates. In the laminates are precious metals such as silver, stainless steel, copper, gold, titanium chromium and others which are coated onto the polyester via a method known as Vapour Coating or Sputtering. This is a process of converting the metal particles into a fine mist or vapour with a positive charge and passing the polyester laminate through this “mist” with a negative charge to give an even coverage and this enables colour stability and longevity of the product. This metallised layer is then in effect sandwiched between the Scratch Resistant Coating and another laminate of sometimes a colour stable dyed laminate, which then has the adhesive and UV inhibitors on that. The clear release liner is a waste product that protects the adhesive before final installation. Look at the info-graphic below. It shows just how good window film is. Are Conservatory Roof Blinds A Solution? Many people resort to having conservatory roof blinds installed to combat against the affects of the sun. But are they effective? Blinds are very good for interior design, can add a solid warm feel to a conservatory and give un-matched glare control. But we ask; why have a glass conservatory roof, if you are going to cover it up with roof blinds? 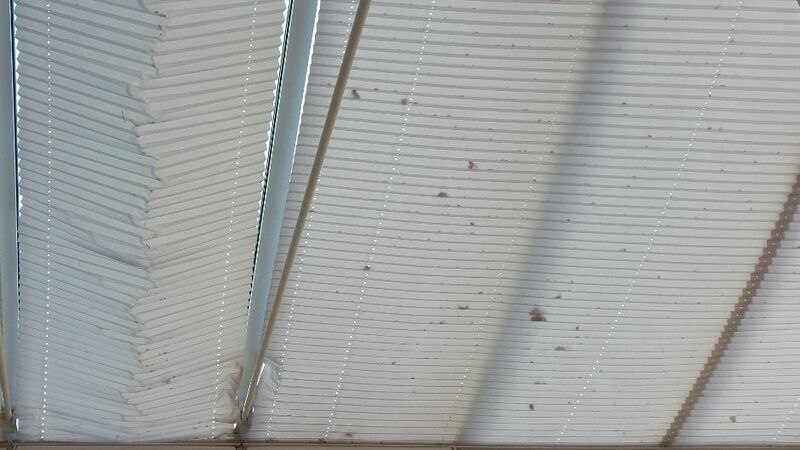 Would you like your conservatory roof looking like this? 1. Blinds cost £££’s and have a very short warranty and lifespan. 2. Blinds do not stop the heat entering through the glass, this results with the suns heat still entering into your conservatory. 3. Blinds block your view out when drawn. 4. Blinds are a furnishing quickly damaged by UV rays. 5. 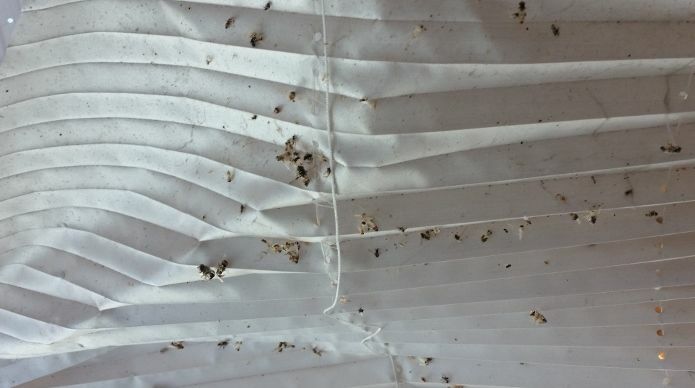 Blinds require regular cleaning as they collect dust and flies. You also risk breaking and damaging your expensive blinds trying to maintain them. 1. Conservatory Window Film is very low cost in comparison and has a 10 year guarantee. 2. It stops the suns affects at the glass, immediately reflecting it away and in winter can reflect internal heat back into the room. 3. Conservatory Window Film has dramatic heat and glare reduction which means you can sit comfortably in your conservatory again, especially in the summer months while still maintaining full optical clarity. 4. Window Film blocks over 99% of UV and has a life expectancy of 15-20 years. 5. Film requires no maintenance, just clean like any other window. That’s it.